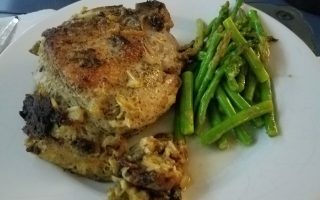 I went scouring the internet for crab stuffed pork chops. I had trouble finding one that did not have bread crumbs in it. Then I stumbled across this recipe! https://ketodietapp.com/Blog/lchf/keto-crab-stuffed-mushrooms, so good! Instead of making stuffed mushrooms, I made a mushroom crab stuffing with jumbo lump crab meat! I modified the recipe, using what I had on hand. This made 2 large pork chops only using 1/2 of the stuffing in the pork chops. This made 4 meals, 2 dinners and 2 lunches for the next day. We had a side of Asparagus cooked in lemon butter! Delicious! Foam block setting. Love it.